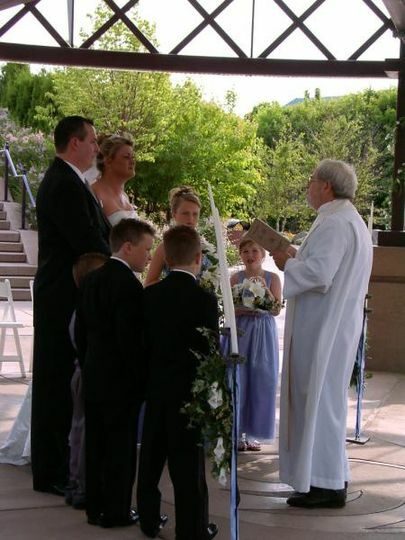 Father Steve Prokop of Saint Paul, Minnesota is an ordained priest and licensed wedding officiant available to help you create a personalized and jubilant wedding ceremony. An extensive history of performing officiating services for over 600 weddings translates to a professional and meaningful wedding experience for couples and their guests. 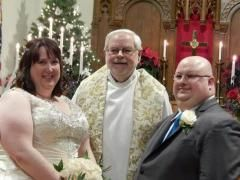 This wedding officiant is an ordained priest, part of the American Apostolic Catholic Church and a member of the National Association of Wedding Officiants. 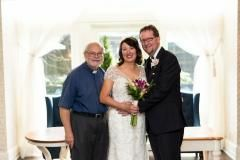 Father Steve Prokop is a licensed officiant with master’s degrees in both history and vocational rehabilitation counseling. He previously worked in employment counseling and now shares his expertise and cheerful manner through a variety of officiating services. Father Steve Prokop is available to perform rehearsals, vow renewals, civil unions, non-religious, single religion and interfaith ceremonies. 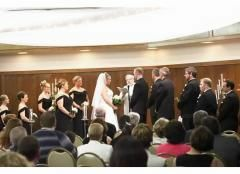 He will personalize your wedding ceremony with services such as readings, blessings, vows and more. As you plan your important celebration, know that Father Steve Prokop offers weekend and weekday ceremony options in addition to counseling. We loved Father Steve! He let us do everything how we wanted it, which was fabulous. We even did our couples counseling through him. 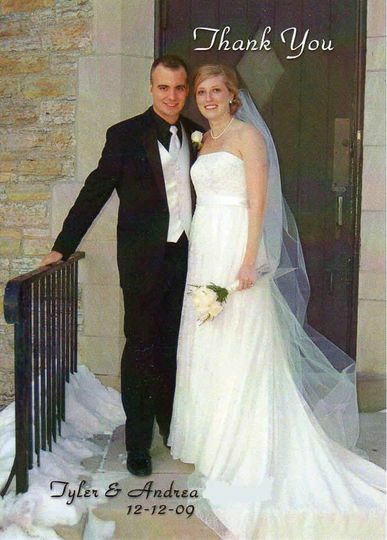 When it came to the big day, he couldn't have done any better. He got all our guests laughing and enjoying themselves. We certainly didn't have a boring wedding! We've heard how much everyone enjoyed him. He was perfect for us and certainly helped make it a joyful celebration! Plus he does a book binding (for an extra fee) of your whole ceremony. It's so nice to have all our readings, vows and homily in one place to look over on our anniversary. 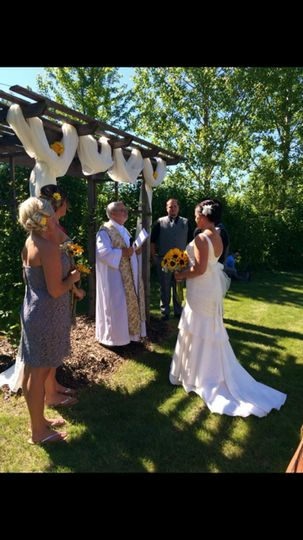 Having Father Steve as our officiant was by far one of our favorite things about our wedding. His humor, compassion, and overall personality was a huge hit for all of our guests. 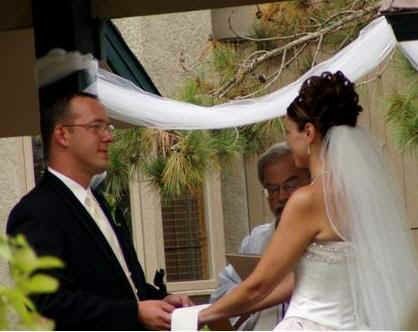 I am usually a very anxious person and I never once felt uncomfortable during our ceremony. He uses the perfect mixture of humor and seriousness to make you feel at ease and to keep everyone entertained! We couldn't have asked for a better officiant. Sidenotes: We did marriage classes through him and they were wonderful. He also does bookbinding and created our own personalized ceremony book which we will cherish forever! We got married on Friday the 28th and already received our marriage license back in the mail. His communication, organization skills, and attention to detail really helped our wedding run smoothly. We found Fr Prokop by chance. Our issue was that we're a gay couple and one of us really wanted a Catholic wedding (the other is an atheist who was fine with a Catholic service). Enter Fr Prokop. We knew when we first met him that he was the perfect fit. Dave asked him if he had a problem marrying a gay couple and an atheist. He said "Dave, do you love Josh". Dave said "yes". "Josh, do you love Dave?" And Josh said "yes". He then said he had no problems at all with it. At one point he even moved us to tears. We made our deposit that afternoon and not only that but also did the pre-marital classes with him. We went through the planning and decided on doing a full Catholic mass with latin verses, a cantor, and communion. He was good with that. He also offered to make hardcover copies of our program for an additional charge as he also is a bookbinder (We took him up on that and they are gorgeous). As for the rehearsal, he was on time, organized and ready to go. It went smoothly and we all knew what to do when. The day of the wedding he went above and beyond the call of duty. While we were waiting outside of the church, he got the crowd not just pumped up for the wedding, but when we walked down the aisle, he started the service by asking if everyone was excited to see us get married today. The whole crowd erupted with applause. Our hearts soared. It was such a perfect touch.